Ask our fire safety services Noosa team to visit your property today. Let a fire trained Jim’s Test & Tag technician perform inspection and testing services according to the AS 1851:2012 standard for the routine service of fire protection systems and equipment. As a business owner or manager, you have a duty to provide a safe workplace for your team members. You are required to maintain your property according to the current safety testing standards. Call us today and we will put you in touch with your local Jim’s Test & Tag team member. At Jim’s Test & Tag, we are experts in safety testing. We have an abundance of fire safety trained technicians available in locations across Australia. Get in touch with our fire safety services Noosa team and access our comprehensive range of fire protection services. As a member of the Jim’s Group, our organisation is committed to amazing customer service. Your satisfaction is paramount and we’ll do everything in our power to make your safety testing experience as simple as possible. We have a highly developed data management system in place so that our clients never miss out on a testing appointment. Compliance is simple with our friendly test and tag team. 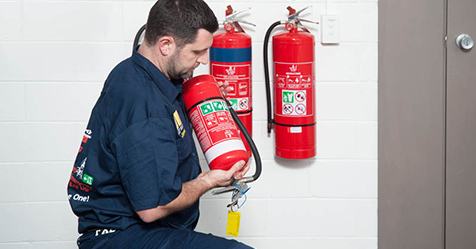 At Jim’s Test & Tag, we test and inspect fire extinguishers according to the AS 1851:2012 standard for the routine service of fire protection systems and equipment. According to this standard, all portable and wheeled fire extinguishers must be tested at least once every 6 months. Pressure testing and refills should be carried out at least once every 5 years. Fire blanket testing is essential in any business with cooking equipment. Fire blankets are specially designed to put out class F fires (fires fuelled by cooking oils and fats). If you run a business, you are required to provide functional fire protection equipment for your employees to use in an emergency. Ensure your staff have everything they need to stay safe during a fire. Ask us about our fire blanket inspection services today. Ask a licenced technician to carry out fire hose reel testing for your business today. Our fire safety services Noosa team members are recognised members of the Fire Protection Association of Australia. They can check the pressure and functionality of your fire hose reel as well as the location and visual condition of your device. Fire hose reels are very effective when dealing with the early stages of a class A fire. This might be a fire that is fuelled by paper, rubber, or wood. If you’d like to know more about why you need a working fire hose in your building, contact us today. We can give you a free quote and more information about your obligations. The AS/NZS 2293.2:2013 is the current standard for emergency light testing in Australia. Our fire safety services Noosa technicians will conduct an emergency lighting discharge test and record results in your on-site logbook. We also have a light bulb supply and replacement service. An important part of emergency light inspection is making sure the lights actually work. We can replace any faulty bulbs with efficient LED lights for long-lasting results. Safety is nothing to mess around with.